TT2011: a most enjoyable meeting, the ISTT dit it again! The 10th Transgenic Technology (TT2011) Meeting is over. The International Society for Transgenic Technologies (ISTT) organized a most enjoyable meeting in St Pete Beach, Florida, USA, with the great help and technical support from In-Conference, Ltd (UK). More than 400 delegates attended this very intense and productive meeting, where participants, speakers, vendors and exhibitors coming from 35 countries around the world, gathered to discuss about the latest technologies to produce and analyze genetically modified animals. The venue was the TradeWinds Island Grand Resort, an awesome place to hold a conference, by the beach and with all what is required to successfully run a large meeting. 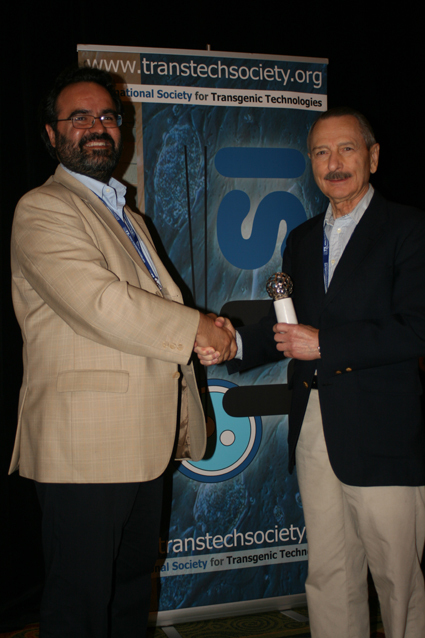 Highlights of the TT2011 meeting included the 8th ISTT Prize for outstanding contributions to the field of transgenic technologies, sponsored by genOway, awarded to Prof. Ralph Brinster (Univ. Pennsylvania, USA) and the 1st ISTT Young Investigator Award, sponsored by inGenious Targeting Laboratory, which was received by Prof. Xiao-Yang Zhao (SKLRB-CAS, Beijing, P.R. China). The next TT meeting, TT2013, will be held in Guangzhou/Canton, P.R. China, organized by Prof. Ming Zhao (Southern Medical University). Author LluisPosted on October 28, 2011 October 28, 2011 Categories general, information, ISTT, ISTT Members, Meeting report, meetings, transgenic research, TT meeting, web siteTags ISTT, ISTT Members, TT2011, TT2011 MeetingLeave a comment on TT2011: a most enjoyable meeting, the ISTT dit it again! The full scientific program and abstracts that will be presented at the forthcoming 10th Transgenic Technology (TT2011) meeting have been published in the latest issue of the scientific journal Transgenic Research (2011) 20(5):1139-89, associated to the International Society for Transgenic Technologies (ISTT). ISTT Members are entitled to access the full contents of the scientific journal Transgenic Research, associated to ISTT, through the members-only of the ISTT web site. The TT2011 meeting will be held at the TradeWinds Island Grand Resort, in St Pete Beach, Florida, USA, on October 24-26, with the welcome get-together pre-conference dinner taking place on Sunday October 23. Over 400 delegates coming from 34 countries, all over the world, from US to Europe, from Asia to Oceania and South America too, will gather in Florida to present, share and discuss the latest developments in Transgenic Technologies. This will be a very special TT meeting, our 10th TT meeting of this series, and we will celebrate in Florida the 10th anniversary with the publication of a booklet with contribiutions by several members of our transgenic field commemorating this event.